To understand and meet its users needs more closely, Golaem recently appointed industry experienced VP Sales M&E and VP Marketing. They both come from the field and have been personally involved in using or developping artists tools for years. Nicolas has been in the animation industry for almost 20 years. He started computer animation as a CG artist in 1993, then moved to Netherlands at Motek to become a motion capture specialist. Back in France in 1995, he joined the Softimage company as a technical support engineer and pre sales. For more than 13 years he succeeded year after year in various positions: 3D animator, demo artist and technical support engineer, product specialist and Softimage trainer, technical account manager. He finally became the country manager for the whole Softimage product range. In 2008, he became a CG consultant focusing on customer needs and projects expectation for various product and services such as Toonz, a 2D software platform for traditional animation, and Damas, a digital asset management software solution for animation studio. As a VP Sales M&E at Golaem, he will be in of charge of all the sales and distribution channel management activities for media & entertainment market. After graduating in mathematics applied to computer sciences at INSA, Alexandre spent two years in Japan discovering how finance was ruling the world, then he secretly studied how to shape chaotic code in usable products at night. He started working on behavioral crowd simulation from 2007 to 2009 as an R&D software engineer at the INRIA. Alexandre co-founded Golaem in 2009. From 2009 to 2012, he was in charge of a crowd simulation project where he developed and tested what would eventually become the Golaem Crowd Behavior Editor. He now leads the marketing effort, listening to customers and translating their needs to the developers dwelling in Golaem cave. Alexandre and Nicolas will work closely together to bring even easier to use and powerful products to artists in the M&E market. Golaem releases a new version of its plugin for Autodesk Maya : Golaem Crowd 2.1, including new rendering proxys for Maya, optimized rendering performances as well as bug fixes. The new Maya rendering proxys will enables artists to quickly test their crowd rendering, launch distributed renders from Maya and design their crowd shaders directly in the hypershade. Golaem Crowd rendering performances have also been optimized. Particularly, the Mental Ray rendering plugin is up to 10x faster while being less memory consuming. Golaem Crowd 2.1 improves collaboration by enabling to easily share behaviors or reuse them in different projects. Behavior Templates: export behaviors in a shared template directory and import them in any scene. Triggers Handles: get an easy access to the behavior triggers by using the triggers handle and easily share conditions between multiple triggers. If you could not make it to Siggraph this year, maybe you missed our new Golaem Crowd demo: Fortress Assault. This demo includes 5 500 soldiers attacking & defending a huge fortress, and demonstrates the features of Golaem Crowd 2.0, released on the first day of the exhibition. All modeling, rendering and compositing have been done by our in-house artist: Axel Domenger. The success of this demo is really the result of our collaboration with great partners. We partnered with Pixar and Greenbutton in order to render our scene with Renderman on Demand (using Microsoft Windows Azure) using the last beta version of Pixar's Renderman ProServer 17 (which improved tremendously our processing time!). 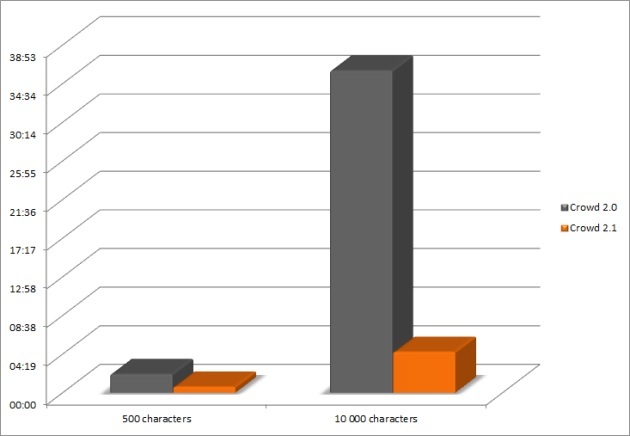 If you are wondering about the rendering stats, you can have a look at our presentation on Pixar's booth. Golaem Crowd 2.0 optimization and multithreading made thanks to Intel tools really helped speeding up the production process. A lot of details are given in this nice Intel Software Adrenaline article, included in the Siggraph Edition. You can also take a look at the presentation we did on the Intel Theatre and get more details about the results. Golaem Crowd 2.0 is out! Golaem sets new standards for crowd simulation in terms of performances and usability by releasing the new version of its plugin for Autodesk Maya : Golaem Crowd 2.0 at Siggraph 2012 Los Angeles. On top of increased productivity, Golaem Crowd has a quicker than ever learning curve. Maya artists will be able to create crowd shots themselves or to test the assets they produce before giving them to TDs, hence strengthening the team efficiency. Discover all the new features and the recently added Maya procedural rendering plugins in the Golaem Crowd 2.0 preview video. No need to learn complex artificial intelligence concepts, Golaem Crowd 2.0 provides an easy way to build new characters behaviors. 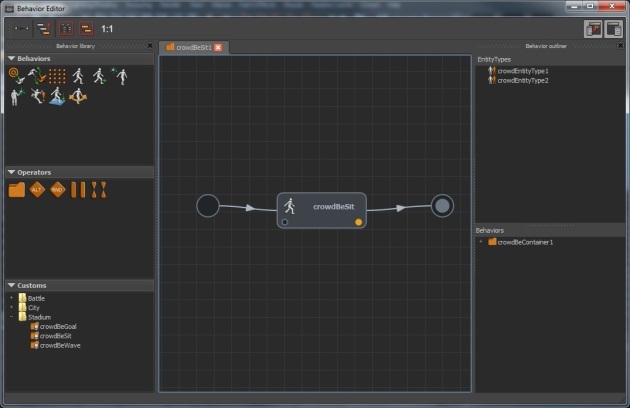 Behavior Editor: create and assemble sophisticated behaviors with this new graphical editor. Golaem Crowd also comes with new behaviors, helping to achieve more in less time. Whether to scale to thousands of character or simply to reduce artists’ waiting time, speed is critical to crowd simulation. Golaem Crowd 2.0 enables artists to get results and previzualisation quicker than ever. Multithread & Optimization: Golaem Crowd 2.0 is up to 15x quicker thanks to its new multithreaded and optimized simulation engine. GPU Character Previzualisation: preview simulation with skinned meshes proxies directly in the Maya viewport. Already compatible in batch mode with the major renderers, Golaem Crowd now offers, with Golaem Crowd 1.5, its lightning fast crowd rendering directly inside the Maya render window, for Mental Ray, V-Ray and Renderman. 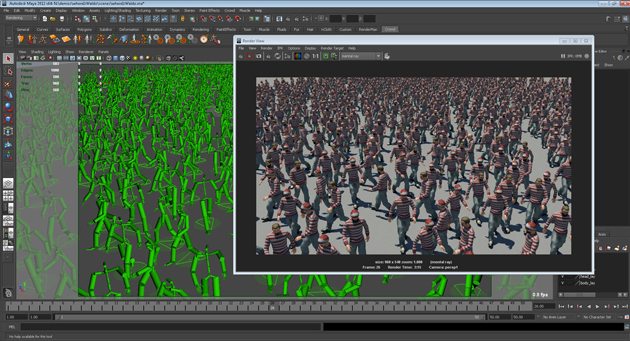 Being able to render directly in Maya enables artists to check the results of their crowd scene more easily and quickly. They can now experiment with their shaders configuration or the automatic assets repartition provided by Golaem Crowd and see results in a snap. Studios not using the standalone version of their renderer, can now, at last, benefit from an efficient rendering method for crowds. Why is procedural rendering the best method to render crowds? Procedural Rendering consists in NOT exporting the characters baked geometry (thus wasting significant time, storage space). Instead, only reference geometries, assets repartition and animation poses are exported to a particle cache. The characters geometry is reconstructed at rendering time using Golaem Crowd procedural rendering plugins, available for the major renderers. Sébastien Eballard, Lead Animator at Mathematic Studio, used Golaem Crowd to populate the Warsaw stadium with thousands of cheering people in the last Euro 2012 Orange commercial. Read the user testimonial in its full extent here. Golaem Crowd 1.5 is the latest version of the 1.x family. Golaem will launch Golaem Crowd 2.0 at Siggraph 2012 Exhibition in Los Angeles, 7-9 August. This new version includes tons of new features as well as up to 15x simulation performances increase.